Cornell University's Uris Library and Mcgraw Tower appear a bit menacing in B&W like a psychiatric hospital. During my time off from real life work, I had a chance to revisit my alma mater during the summer at a time when the weather is absolutely perfect. 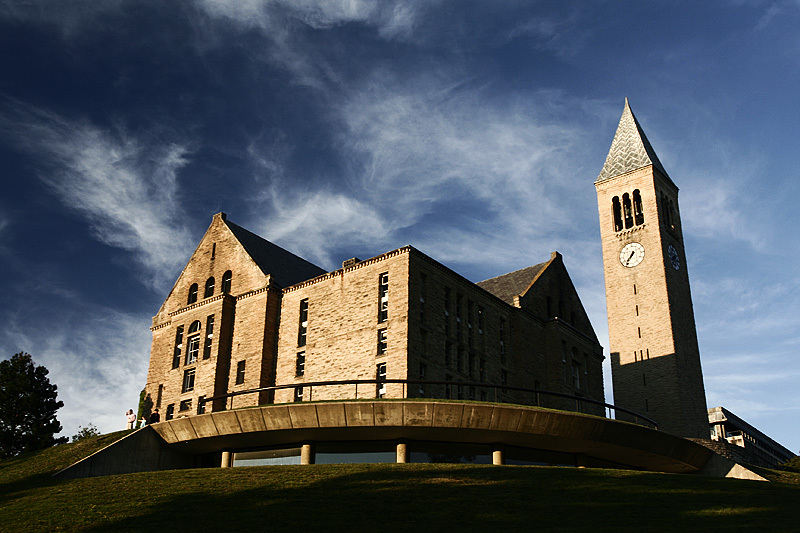 If you ever happen to be poking around the central New York area, give this campus a quick run-by. It's easily the most beautiful ivy league campus and possibly one of the more beautiful campuses in America. We switch gears again today with another non-Korea photo Sunday, featuring a, er, non-Korea photo. WHAT IS THE SOFWARE TO DO THE ALTERNATE BW/COLOR ? JC, I use photoshop to change from color to black and white. Then, it's just Adobe Flash CS4 programming involving a mask and two photos (color and B&W) to allow this effect. I gotta say, learning Flash was a bit tricky but after a week, I was able to barely scrape out a few cool effects in Flash.